When people hear I'm a music blogger, I get all sorts of reactions. Sometimes I try to explain my preference on new indie pop by up-and-coming bands, but usually I just wince through stories of "awesome" bro rock concerts at huge arenas. (I was once asked if I liked "jam," which by itself made me think of the kind that comes in a jar.) However, there is always room for a song on my playlists by the heart-on-the-sleeve troubadour or a fun, jangly group jam. The Olms' new song "Wanna Feel It," perfectly sits in this latter category, ready for my summer soundtrack. The Olms is the latest project of Pete Yorn, whose 2001 solo album, Musicforthemorningafter, brought wide acclaim as that singer/songwriter troubadour type, even going gold. His 2009 album with Scarlett Johansson, Break Up, continued the theme of deeply personal songs about relationships. Here Yorn teams up with musician, artist and photographer J.D. King, enjoying the partnership of a band. "The album has an old-sounding feel, but I feel like it still sounds really fresh,” Pete Yorn writes on the band's Facebook page. “It sounds uniquely like us and a hybrid of our influences, from my love of Brit-pop and groups like The Beach Boys and The Kinks, to J.D.’s love for British Invasion bands like The Animals, as well as bluegrass and country music.” As friends, Yorn and King decided to write a song together that quickly let to enough to fill and album. They decided to record on tape, utilizing a vintage AMPEX 440 analog recorded that provides the "warmth and hiss," according to King on Facebook. “It gives the sound a transience and depth that you don’t get when you track straight to digital,” he explains. The full album is due out June 4, but there is a three-song EP available with art nouveau-inspired cover artwork by King. The band is the first signing to the newly re-launched label, Harvest Records of Asheville, North Carolina, home of classic 70s albums by Pink Floyd and ELO. 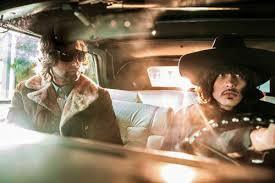 The kicker tune, "Wanna Feel It," is on heavy rotation on KCRW's "Morning Becomes Eclectic," where it caught my ear. Its golden SoCal feel belies the themes of "numbness and apathy" (according to the band), with lyrics wistfully asking for "time for a conversation." 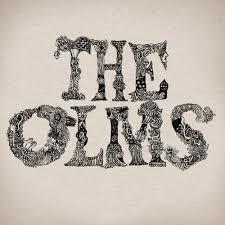 The song is available as a free download when you sign up to their newsletter on their website, theolmsmusic.com. Take a listen with the retro black and white video and check out tour dates below.